According to Francis it was not necessary for Jesus to have come and died for the old law was never revoked! 247. We hold the Jewish people in special regard because their covenant with God has never been revoked, for “the gifts and the call of God are irrevocable” (Rom 11:29). Various quotes and pictures coming from the true Catholic(true traditionalist) position. There are many pseudo trads out there who think simply by going to a latin mass at FSSP of the local diocese that they are traditionalists....This is not at all the case please listen in. Please share in all your Catholic groups I need your support in getting these videos out there brethren. On February 15, 2014, the Vatican's newspaper L'Osservatore Romano published on page 4 a picture of Hindu divinity Ganesha. TCK Presents: An Eagle's Message, "Unify"
Please like this video on youtube and share it. these 15 min videos take over 4 hours to make please do share to help this crusade. TCK PRESENTS: MAITREYA, THE ANTICHRIST (Part 2)? Please SHARE and help this video go viral! This is a new series I am doing on the potential Antichrist Maitreya! It is loaded with quotes and videos. Share unto your page and the various groups your in. This will be at least a 4 part series. TCK PRESENTS: MAITREYA, THE ANTICHRIST? That keepeth my heart and soul as Ruler over sin that causeth death throughst You. “Thy Sacred Heart art enthroned above all and keepeth death as but a mere prisoner within thy chambers with no plea bargain for release nor parole for thy future. Was Cardinal Siri the supposed Pope(Gregory XVII)to flee Rome? No, seems it will be Benedict(Bishop in white) I have the consensus of all the Saints prophecies and they tie in with an Infidel/Communist invasion of Europe, Italy specifically. Yet another reason to avoid the sedes, Cardinal Siri was more liberal than most trads think he supported the New Mass and can be seen offering it. Does a Pope who teaches heresy still remain materially over the Church? Yes and history shows this repeatedly. The Church was guaranteed infallibly papal successors until Christs second coming. No Pope can be a formal heretic he has no judge to judge him so while alive. Has there been past Popes who have been anathematized and excommunicated publicly therein after teaching heresy? Yes, Pope Honorius and there were other heretical Popes who relinquished their heresies. Pope Honorius was not and is not an antipope. Was Vatican 2 infallible and binding on the faithful? No it lacked the necessary marks to be called a Dogmatic/Infallible Council and by own admission of the Council and Conciliar Popes is only pastoral therefore nonbinding. There was no new dogma issued nor any defense against heresies or errors of the day. One must distinguish between the Infallible Extraordinary/Ordinary Magesterium and the authentic "fallible" Magesterium when in such a crisis where the upper hierarchy is teaching heresies. Is Pope Francis, Peter Romanus or Peter II? Absolutely not and in fact he might be the imposter Pope/antipope if he is the one to make use of an invalid excathedra to unite all religions and man under the quise of protecting peace. Time will tell for now he is and ought be recognized as Pope. Has the true consecration of Russia to the Immaculate Heart been performed? NO! Pope John Paul II even admitted so ...our Lady still awaits..
Has there been any councils that were invoked and later made null and void by a current/subsequent Pope? Yes, there has been a handful, second council of Ephesus is one 20 years later put down by subsequent Pope at council of Chalcedon. Even a universal Council that is not local which is not infallible can be revoked it does not just pertain to a local Council. Are traditionalists/SSPX schismatic? No, recognizing a validly elected Pope while resisting his heresy is not schismatic.. Vatican II was a robber heretical and schismatic council. Again, history reflects such, St Athanisius who resisted the Arian heresy that was supported by Pope Liberius was not only not a schismatic even though he was wrongfully excommunicated and exiled many times, he is remembered as a Doctor and Father of the Church while Pope Liberius was all but forgotten and whose named was removed from the Roman Martyrology. Meaning he was wrong, St Athanisius was right much like the present situation albeit we are in worse times, of traditionalists resisting the Vatican 2 french revolution. Likewise with those resisting Pope Honorius's monothelistic heresy. If SSPX/traditionalists are schismatic then that means the Church before Vatican 2 and all the Saints/Popes/Doctors are schismatic as well. Of course it is not denouncing this absurd opinion. Question: Why dont you work from inside the Church instead of outside the Church? Answer: True Traditionalists/SSPX are not outside of the "Church" while objectively speaking the modernists of Vatican II are not "inside" the Church. When one speaks on the Church this is always presupposed by the Faith. If the Faith is not being maintained by our Pope and the "Church" since Vatican 2 then how can one commune with heretics when our Faith says we cant. And furthermore I actually have done this and you know what I received in message dont ever teach/preach here anymore. So as St Athanisius teaches you can not go into these churches until they are corrected and being that starting form the top objectively speaking the top isn't corrected then how can one go into these churches to do so? So they can be treated as I was? Therefore when we say "Church" its those objectively speaking who are really keeping the faith of which the Conciliar Church is not. They have the building we have the Faith says St Athanisius hope this clears up the fact that traditionalists are catholics and in fact one cannot hold full communion with the tenants of Masonry/liberalism and be called catholic even if a pope says so. The CHURCH has already spoken on the matter that no Pope can change. Can I go to a Latin Mass community, FSSP, Institute of Christ King? What about Michael Voris, Father Z are they not traditionalists? No, they are modernists who teach/hold to a latin mass, they hold full communion with Rome and those liberal/Masonic tenants coming from Vatican 2 Rome. Cant be a liberal and be a Catholic. I designate objectively such souls in the future as "pseudo trads". You must avoid. Is the new humanism that the Conciliar Church/Popes teach Catholic? No, in fact the same philosophy/theology was condemned during the times of the french revolution and the condemned council of Pistoia wherein the liberals(bishops) at that time taught these same heresies and novelties by and large and was condemned including a venacular Mass and emphasis on Christs humanity. New Humanism is apart of the new religion of Vatican 2, it runs contrary to Thomism/Scholasticism and cannot be accepted to be/remain Catholic. From thence stems the heresies and novelties of the New Mass, the new Sacrament of rites, right to religious liberty, liberty of conscience, separation of church and state, democracy(Masonic) over Social Kingship of Christ(Monarchy), freedom of press, freedom of speech, masonic tolerance/coexistence in false ecumenism. All taught by the Conciliar Church/Popes stemming form Vatican 2. Is Limbo a Doctrine binding on the Church? No, it is not binding but has been taught since the early Church. Liberals try to do away with this teaching as the Conciliar Church is even the present Pope. Is capital punishment Catholic teaching? Yes, it is although not a binding doctrine has been consistently taught throughout the Church again in the Council of Trent and as recently as Pope Pius XII to reiterate this the liberals again in the Conciliar Church including the present Pontiff and Bishops are trying to remove it. Capital Punishment in no way impedes Catholic teaching and actually is taught as a great mercy upon society to protect the common good when reading the Church's interpretation. What is Papal Infallibility? Papal infallibility only extends to a Pope when he makes use of excathedra and when what he teaches falls in line with the Infallible Magesterium/Tradition. Thence a Pope can/could teach his own opinion and teach heresies which of course history reflects. When a Pope speaks in accordance and in the same sense and interpretation as always taught we say yes to Peter and when he speaks on his own accord contrary to the Infallible Magesterium/Tradition as always taught then we say no to Simon. Even Peter denied our Lord three times. The Pope is not God and not infallible when he utters any sentence as modernists make it seem as well as sedevacanists fall into this error. Do heretical priests effect the fruit of the Sacraments? Baptism yes, the sacraments of reconciliation and Eucharist NO says our faith St Thomas Aquinas included. Although the Sacrament would be valid meaning it takes place there is no fruit or GRACE from the Sacrament therefore another reason in prudence to refrain form any novus ordo priest. Question: You say apostasy from or within the Church does that means the Popes are Apostates and the Conciliar Church is Apostate? No, when we say apostasy from the faith, we mean a loosening from the faith; a sliding from the faith in heresy and novelty. Sedes make the error in calling the Conciliar Church the Apostate Church and even some trad's. It is not yet Apostate that comes under a soon true antipope who will "dogmatically" make excathedra declaration making all religions equal or something quite similiar along those lines, thus making it an Apostate Church. When we denote New Church it is in formation it is not yet solidified as the Apostate Church yet. This is the proper context of "Rome will lose the Faith"(LaSallette), that is, dogmatically will lose it under an excathedra (via true antipope). Vatican 2 was a revolt nonetheless. When one reads AA-1025 we even see there plans for Vatican 3 where they say they are going to do just what as I indicate above. The "Church" can't teach heresy(indefectible/infallible) but churchmen in the Church can teach heresy including the Pope see the difference. Question: So, What are you telling me is the Endgame of this Apostasy within and of the upper ecclesiastics of the churchmen? "In the Third Secret, it is foretold, among other things, that the great apostasy in the Church will begin at the top." Does this mean the gates of hell have prevailed? How could it, we have had heretical popes and schismatic councils before in the past and the faith, true faith is still here is it not. Even if the true faithful are reduced to a handful the gates of hell cannot prevail even with a heretical pope and schismatic council. Are the Jews, Israel, (the State) Gods Chosen people still? No absolutely and unequivocally NOT. Israel was a foreshadowing of the Catholic Church. When Jesus came the Jews rejected Christ and ceased to be chosen of any kind. Jesus himself accursed the Jews(fig tree). This is true Catholic teaching referencing the Popes and Saints of past previous to the diabolical Vatican 2 revolution. The Old covenant is revoked and all those who want to obtain the Beatific Vision MUST come thru the Catholic Church via Christ, not thru freemasonry via the budding newchurch within the Church. The state of Israel is a Zionist state bent on the new world order of their "new jewish messiah". One cannot support the state of Israel and be called Catholic and is a slap in the face to our Lord of whom are faith teaches the Jews are accursed. Distinquish between Jews in heritage (for by heritage they still could be a Catholic) and those practicing there noncatholic "faith". The old law is dead swallowed up by the Sacred Heart of Christ. Do Jews and Muslims worship the same true God? Absolutely not, they deny our Lord, the Holy Ghost, the TRUE GOD WHO is the HOLY TRINITY. This is a masonic heresy that comes form the top of the church. It is binding DOGMA to believe in the Holy Trinity to get into heaven, Jews and Muslims are religions of antichrist the Church truly teaches(not the last two popes of course). What is the Triumph of the Immaculate Heart and the period of peace? It is when the second Vatican council the french revolution within the church is removed, the new mass included and we return to Tradition. It is a victory through our Lady over these heresies and novelties. It is also a victory over Islam and Communism in a soon new crusade of the Church. It is a restoration of Catholic monarchies. This period of peace will be more brief a generation then Antichrist cometh. The revived Holy Roman Empire the Fathers teach and interpret is the "restrainer" that holds back antichrist. When will Mary be proclaimed CoRedemptrix? In the great Council of Peter II which will bind the Council Infallibly, as well as I suggest make null and void of Vatican 2, the New Mass and all the heresies and errors of the last 50 years or so. Who is the Great Monarch? A holy king/emperor who will arise to be Peter II's right arm of justice in the world to restore holy Christendom. After Russia is truly converted they will join the great Monarch and virtually the whole world will be truly catholic, non vatican 2 style. What is a more general sequence of events? Reminding you our Lord said to watch and pray meaning He wanted us to see these signs so you could know the season. And without giving dates this was put under excommunication for those who do I say more generally: Continued communist laws here in America and abroad, revolutions all over, varying chastisements of nature in earthquakes, storms revolt of the earth crying out in justice. A world war between virtually all nations, epidemics, worldwide economic collapse, a Pope who will undo the Revolution of Vatican 2 with rise of the Great Monarch, the three days of darkness, then triumph of Immaculate Heart with a Great Council that undoes Vatican 2. Do traditionalists(Catholics) speak there own "opinion" thus making themselves protestants? No we/they reiterate what the Church has always taught before the modernists and masons hijacked the Church by way of the Infallible Magesterium with aide of the Saints/Fathers/Doctors therefore the ones who are protestant are those not teaching in accordance to Tradition/Infallible Magesterium. So it is not personal interpretation but rather the interpretation that has been passed along for nearly two milenia until the diabolical vatican 2. Because one holds a position of authority does not guarantee he is keeping the Faith then by logic one must know the Faith and know it very well, that is, what was taught before Vatican 2. Can I go to an orthodox church then or Byzantine Rite? No you cannot the Oriental, Greek and Russian orthodox are still schismatics theologically you cannot at all go there. And although the Byzantine hold a valid rite they still follow Vatican 2 therefore you cannot go there as well. Brethren you cannot go where the Faith is NOT. Due to the Vatican 2 Apostasy form the Faith here are very few places(true traditionalists) holding the proper theological position and Faith. Cannot commune with novus ordo heretics. Does papal succession which the Church was guaranteed infallibly mean there would be "no" popes who claim to be Pope or antipopes in between without a true Pope?.... No! The Church was guaranteed successive papal successors infallibly. I had a sedevacanist tell me today successive meant "essentially" one after 50 years. Pope Pius XII, no pope, no pope, no pope, no pope, no pope, then now potentially a Pope. This by any degree of education even elementary is NOT successive(one RIGHT after another). Question: Please define what a true traditionalist is? A TRUE TRADITIONALIST is one who recognizes a valdily elected Pope but is resisting the vatican 2 revolution these Popes have so sadly supported and taught. FSSP, INSTITUTE of CHRIST the KING, Michale Voris, Father Z, your local diocese Latin MASS ARE NOT TRADITIONALISTS. SSPX, SSPX-SO, SSPV (so long as there not sedevacanist) Independent Chapels are acceptable. Sedevacanists are ULTRA-Traditionalists so avoid its a schismatic theological position. Therefore, do not read the mainstream Churchs viewpoint on what a traditionalist is they cant even figure out there in a new religion of man following the tenants of liberalism/masonry let alone get this term correctly applied. Should I be worried about the times ahead? ABSOLUTELY not for this would be of the devil. 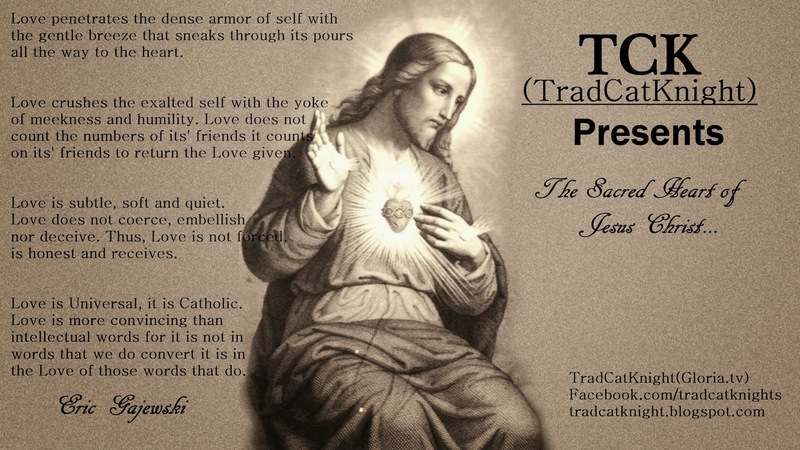 Stay in prayer, penances and reparations unto the Sacred heart thru the Immaculate Heart, stay in a state of grace find/locate a true traditionalist church not in full communion with Rome such as SSPX, SSPX-so, independents those who recognize a validly elected pope but are resisting this revolution. If this Pope is the one who unites all religions via an invalid excathedra can he still be Pope? Absolutely not and it could be why Benedict retained the title of Pope Emeritus. He would cease to be Pope and the Church would fall into Apostasy and claim to be Catholic/Universal. And sill since we keep the faith the gates of heel will not Triumph. The true Church/believers could be underground so to speak for 2-3 years until after the chastisements clear the table and Peter II can arrive. Can a pope declare a Church council, such as Vatican II, null and void? - The Council of Ephesus (449) was regularly called and attended by all the Eastern bishops and by legates from Pope St. Leo the Great. That pope nullified the decrees of that Council and branded it the Latrocinium, or "Robber's Council," by which disparaging term it is known to this day. - The Qunisext Council (692) was declared a "reprobate synod." As authority for this verdict, we have St. Bede the Venerable. - The Council of Hieria (754) introduced and blessed heretical Iconoclasm, with the well-known catastrophic consequences for the Church. Pope Stephen II nullified the decrees of that Council in 769. - The Council of Pistoia (1794), involving the Holy Roman Emperor Joseph II, the Gallican bishops of France, and some bishops of Italy, blessed liturgical changes that resemble to an amazing extent the corrupt innovations of the New Order after Vatican II. The Council prescribed that there should be only one "table" in each church; condemned processions in honor of the Blessed Virgin and of the Saints, the Rosary, the Way of the Cross, and holy images; instituted a "simplified" Mass said entirely out loud in the vernacular. Pope Pius VI nullified the decrees of that Council in his Bull Auctorem fidei of the same year as "rash, offensive to pious ears, insulting to the Church, favorable to the charges of heretics against [the traditional Latin Mass]." Thus, several Church councils in the past have been nullified by popes, so it is not a problem to include in that number Vatican II, which was called and promulgated not even as a dogmatic council, but as a merely pastoral council. In the past, it has usually taken about a century for these troubled periods in the Church to be resolved, and we are only fifty years into the post Vatican II period. But the resolution of troubled periods in the Church involved far more than just a pope. **Modernists will argue that Vatican 2 was a universal ecumenical council presided over by a Pope and can not. This is false even a universal Council lacking all the necessary requirements for a Council to be an act of the solemn/Infallible Magagesterium can be made null and void later by a Pope/Council. V2 did not proclaim any new Dogma binding Catholics infallibly nor did it condemn/teach against any heresies of the day to be considered such; it was by the Popes own admission a pastoral Council only to interpret the Church according to the modern world and man.